When last we met, ’twas overtime in Dayton, and we started asking ourselves, “Can Josh Richardson – Josh Richardson – be the alpha for this team?” Five years and two coaches later, Josh Richardson is the leading scorer for the Miami Heat, and Tennessee is aiming to be the the alpha in college basketball. The Vols looked like it – as much as a No. 2 is supposed to against a No. 15 – for significant stretches of the first half against Colgate. In the second half, Jordan Burns decided he wanted a piece of that action for himself, and took it until Admiral Schofield wrestled it away in the final minutes. Winning is the only thing that matters now, so no need to belabor yesterday’s performance specifically. A tip of the cap to Jordan Burns. But how does yesterday’s performance play into what this Tennessee team will do with this tournament, with a not-dissimilar opponent from Iowa City headed our way next? 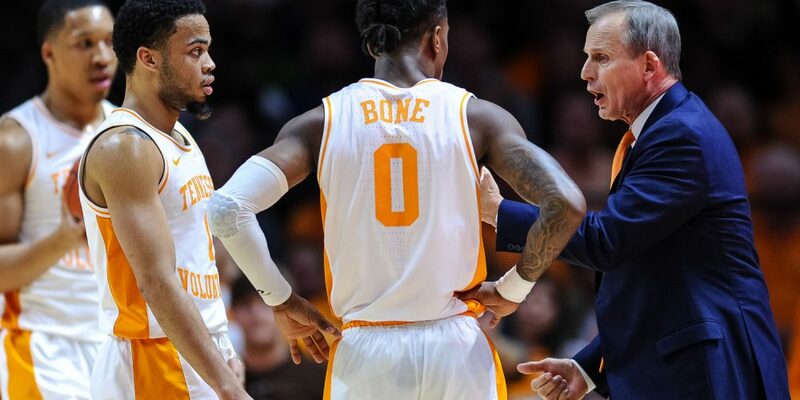 The Vols were 9-of-26 (34.6%) from the arc against Colgate; too many, some will say. And it’s true, the Vols are 22-1 when they take less than 22 threes, 8-4 when they take 22+. But for every bad – 8-of-22 at LSU, 7-of-25 at Kentucky, 7-of-27 vs Kansas, 9-of-28 at Auburn? There’s also this: 10-of-21 vs Kentucky in Nashville, 8-of-22 vs Kentucky in Knoxville, 6-of-23 vs Mississippi State in Knoxville, 9-of-23 at Florida, and 12-of-29 vs Gonzaga. And Tennessee’s second-highest percentage from the arc on the year is…Auburn in the SEC Tournament, where if you said the Vols would hit 8-of-15 (53.3%) coming in, we’d have praised their patience and assumed we cut down the nets. And often the one leads to the other, which is really where Tennessee’s best basketball lives: a touch for Grant, then a good shot or good ball movement. At times Colgate crashed four guys on Williams; he has to pass, and those guys have to take that open shot. Admiral Schofield hits 41.6% on the year, Jordan Bowden 36.1%. Those guys need to shoot that shot. Just maybe not against Iowa. The Hawkeyes allow just 32.3% from the arc, 59th nationally. The Hawkeyes allow 53.6% inside the arc, 306th nationally. They’re not just some group getting hammered inside: Iowa is 63rd in opponent free throw rate. But when you put their two-point defensive numbers together with the assist rate they allow (58.3%, 316th nationally), this is a team you slice up with good ball movement. Tennessee’s assist numbers have gone down as the competition has gone up in the last month. The Vols have nine games on the year with less than 15 assists; seven of them have come in the last 11 games overall, including only 13 assists vs Colgate. That’s a good number to think about for Iowa: when opponents have more than 15 assists, Iowa is 7-9. When it’s 18+, Iowa is 2-7. And when opponents have 15 or fewer assists, Iowa is 16-2. There’s a pacing issue here as well. In the Big Ten, Iowa is second overall in tempo and first in shortest offensive possession length. But they’ll only be the seventh-fastest team Tennessee has faced this year. The Vols should be able to get the shots they want against this defense. Will the same be true on the other end of the floor? There are no guarantees. In the first round, some elite offenses met their match: farewell to Iowa State (#10 offense KenPom), 6-of-22 from the arc against Ohio State; our friends from Starkville (#15 offense) watched Liberty shoot 12-of-25 (48%) from the arc. And on the other end of the spectrum, Top 10 defenses from Wisconsin (#3), Kansas State (#6), and VCU (#7) all went out in the first round. The Hawkeyes are 14th in offensive efficiency, putting them right next to Mississippi State; Villanova, who could be next, is 16th. Tennessee has seen better from Gonzaga, Auburn, Kentucky, and LSU, but the Hawkeyes are still potent. It may surprise you to know Tennessee has won each of its ten worst performances defending against the three. Colgate’s 51.7% was second on the year, behind South Carolina hitting 14-of-23 (60.9%) in Knoxville. Some of Tennessee’s best wins are on that list, including Kentucky in Nashville, Louisville, at Ole Miss, and Gonzaga. The Vols have been good enough to not just survive against hot-shooting teams, but beat some of the best teams on their schedule and in the nation. But in March, it only takes one of these going wrong to end you. Colgate flirted with it yesterday, Iowa may again tomorrow. And Tennessee, a seven-to-nine point favorite depending on who you ask, may again just overcome it on the offensive end, or make the plays, again, down the stretch. Tennessee’s offense is that good. If the Vols are looking to cut down nets, they’ll have to be better on the defensive end. Iowa would be a good place to start. The Vols and Hawkeyes go right away on Sunday: 12:10 PM ET, CBS. Louisville awaits.